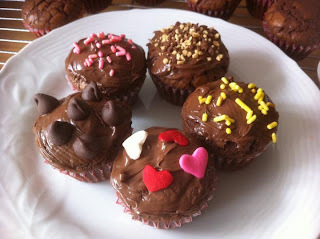 It's been a while since I last blogged about my baking. I've been pretty busy with my jewelry business, packing up the place for major home renovations and baking for the Christmas season. Here are some photos of what I and my daughter have done so far. 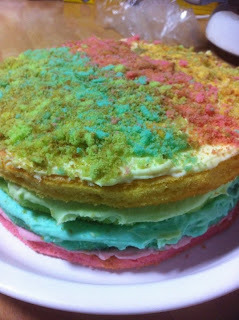 A few weeks ago, my 16-year-old daughter decided to bake me a surprise rainbow cake! She had never baked on her own before although she had helped me previously to measure out ingredients and check on the doneness of the cakes. I thought it was a wonderful effort considering she followed a recipe taken off the internet and the cake tasted quite nice (a little too sweet for me but she did follow the recipe). Her colour mixing was great too. I'm so glad she was inspired and I was really touched by her gesture. Needless to say, the kitchen was a mess but I didn't really mind. For Teachers' Day this year, my daughter asked me to bake some brownies for her teachers. 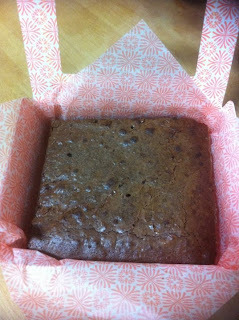 I decided to teach her how to make them (my philosophy of teaching her to "fish") and here's her completed brownie! We used Elle and Vire butter together with a mixture of 52% and 74% Valrhona chocolate. It was delish! I found a recipe on the internet for Nutella brownies and decided to make them because they looked simple and only needed three ingredients! Nutella, egg and flour!! Here's the mini brownies before going into the oven. 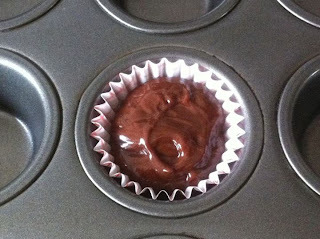 It's amazing how 1/2 cup Nutella, 1 egg and 5 tablespoons of sifted cake flour can go such a long way in producing 12 mini brownie cupcakes. 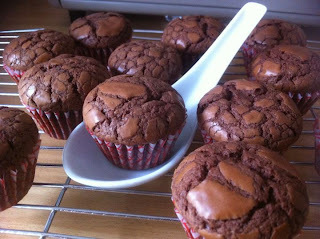 I love how the brownies puffed up to make the domed tops, after being in a 145 degree C oven for 12 minutes. Here's another shot of the brownies in my soup spoon to show you how small they are. Practically guilt-free! Go ahead, try them! 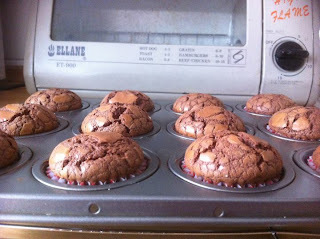 Make two batches if you have Nutella or chocolate lovers in your family. I wasn't planning on baking this year because I'm still trying to pack up my VERY messy apartment and we were going to be away for the Chinese New Year holidays anyways but turned out I had to. Why? Well, I was planning to buy CNY goodies from the stores but I didn't like what I sampled. So, on Tuesday, I decided to bake! Mind you, this is only for my neighbours and relatives. This year besides the usual pineapple tarts, I decided to try peanut cookies and almond cookies. Turned out the recipes I used were best I'd ever tasted! Light and melt-in-your-mouth! So I'm really pleased. I love how the cookies "crackled" like the traditional Chinese cookies. They smelt wonderful while baking. This paler cookie uses ground almonds. Very aromatic. Almond cookies after baking. They ballooned out and ended up round and fluffy looking. These cookies turned out so well I'm quite pleased. Have a great Chinese New Year celebration with your family, relatives and friends! This year started with a blast into busy-ness. I had to refurnish my home office and work studio due to lack of storage space. It took more than a week to find the furniture I liked and had to wait another week for the furniture to arrive. When the furniture finally came, we received news that my 3rd uncle had passed away in Malaysia so packing was interrupted by a drive up to Petaling Jaya for the funeral. Now that we are back in Singapore, I've resumed unpacking and foresee it's going to take another week or so. We are planning to go back to Malaysia to meet with the Yam clan for the Chinese New Year. All this to say my apologies for not baking this year. I know some of you were hoping to order pineapple tarts and cookies but I know you will understand. Perhaps I will bake for Mothers' Day. Let me know what you think, okay? If enough people order, I will seriously consider it. My pineapple tarts are heart-shaped. I use French butter in the pastry and I cook the pineapple jam myself. Each tub is filled with 30 tarts. So until I chat with you again after the 4th day of Chinese New Year, have a great family season together! The family and I had a great time in the Gold Coast and Brisbane. Out of the 14 days we were there, it rained for about 9 days! However, we were not deterred from having a good time. Check out my jewelry blog to see some of the highlights of our trip. On this blog I'll post the food stuff! We had heard quite a few good reviews of Cav's Steakhouse so decided to go there. Very interesting concept because we had to order our own entrees at the counter and choose our own uncooked meat which they cooked up for us. This was a huge piece of rump steak with black pepper sauce which was really juicy done just right. The baked potato had real bacon! We also had a medallion fillet which was melt-in-the-mouth. Absolutely no fat but juicy and tender. Can be compared to filet mignon. The prawns were absolutely delicious. Tasty, sweet and aromatic. Best prawns I've ever had. Our young man in the family opted for the mixed grill which as you can see is HUGE! He ate everything and tried food from our plates as well! We enjoyed our steaks so much we went back to Cav's on our last night in Australia. Alethea with her pork ribs kid's meal! This was at Tambourine Mountain after our 4WD tour of the Hinterlands. The birds were not shy and one even sat on my head while waiting for the others to finish eating! I thought you might want to see the different sizes ants come in! Apparently the small ones hurt the most. This was on Keng Mun's wishlist. The last time we visited a winery was more than 20 years ago. Sirromet Winery is quite big in Australia with several vineyards. We visited the one on Mt Cotton. We also had a wine tasting session and the children joined in as well. On our way up, we saw some grapes on the vine so jumped out of the car to take photos. In the background was a kangaroo who hopped away discreetly. We had a quick lunch before our 12noon tour. The children had their first taste of guacamole, sour cream, beef, nachos and cheese. As usual it was a large serving so the two shared the meal. I think they liked it because they stopped talking for a while! Behind Keng Mun is the winery. The weather was gorgeous and we enjoyed the fresh air. This rack was used by the French when they let the wine sit in the leaves for months and months. On Christmas Day, all the shops were closed but we found this Chinese cafe tucked away in a corner and decided to have lunch there. This was Alethea's tom yum noodles. It was too sour for me! Singapore laksa! Tasted nothing like the one back home. They added cabbage and egg noodles (like wonton noodles). We visited the Tropical Fruit Farm and here's Keng Mun and Alethea cracking macadamia nuts for our morning snack. They are really hard nuts to crack. Loads of fun though! Well, so much for our Australian escapade. Thanks for joining me today. As for baking, I'm not sure when I will heat up my oven this year. I've lots to catch up on and lots of new assignments on my plate. Check back once in a while though but do check http://www.rebeccayam.blogspot.com/ more often for new jewelry designs.